Bhatnagar, Aparna is Founder Director Green and Good Store, Jaipur, Rajasthan. She is a social entrepreneur and runs “The Green and Good Store, an online store dedicated to promoting “responsible consumerism” in India. 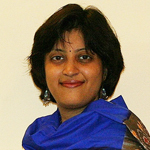 Aparna is an alumna of Delhi School of Economics and IIM Ahmedabad and has a keen interest in sustainable development. Her store brings her in contact with artisans from all over India as it attempts to promote traditional knowledge in communities.